Building cloud solutions, whether with private or public clouds, requires investment of time, energy, and money. To ensure best return on your investment, you need to build your solution on a platform that can scale and perform well to meet the changing demands of your business. This means being able to take advantage of cutting-edge hardware that can provide extreme performance while handling the largest possible workloads. It means being able to use resources effectively at every level, while ensuring that SLAs can be met. It means reducing the chances of mistakes occurring when maintenance tasks are performed. And it means being able to monitor performance effectively to ensure computing, storage, and network resources are used with maximum efficiency. Windows Server 2012 delivers a virtualization platform that can achieve the highest levels of performance while delivering extreme scalability that enables new scenarios for migrating massive workloads into the cloud. This section examines some new features in Hyper-V and in the underlying operating system that enable such increased scalability and performance. Hyper-V in Windows Server 2008 R2 has been embraced by many organizations as a way of making more efficient use of physical server hardware through virtualization and consolidating server workloads. But limitations in the number of logical processors supported on the host and for VMs, together with limitations of how much physical memory can be supported on the host and assigned to VMs, has meant that Windows Server 2008 R2 lacked sufficient scalability for certain types of mission-critical business applications. For example, large database applications often require large amounts of memory and many logical processors when used to implement business solutions involving online transaction processing (OLTP) or online transaction analysis (OLTA). Until now, the idea of moving such applications into the cloud has been mostly a dream. Please keep in mind that this is largely dependent on the configuration of your hardware and the support of the guest operating system and integrated services that are provided for the VM. The expansion of available processor and memory allocations would allow for your administrators to allocate VM resources as needed. Since many enterprise scale applications continue to consume additional resources to feed the needs of the organization, Microsoft has taken a tone to assist with this demand by increasing this memory and processor support in Windows Server 2012. One of the points brought to our attention in Windows Server 2008 R2 Hyper-V was the limitation of the hardware portrayal to the VM. With a large number of IT organizations seeking to consolidate their server farms to a handful of servers and virtualize many large infrastructure applications such as Microsoft SQL Server and Microsoft Exchange Server, we decided to move toward larger scalability for these VMs in Windows Server 2012. With Windows Server 2012, the amount of virtual processors that you can have on a SQL Server 2008 virtual machine can go to a max total of 32 virtual CPUs. This is a large increase from the 4 in Windows Server 2008 R2. Additional RAM is another point that our customers had requested be available to their virtual machines. With hardware able to run multiple terabytes of RAM and physical systems running 32, 64, or 128 GB of RAM, the ability to provide more RAM to the VM became needed as newer, advanced applications took advantage of the larger RAM available. In Windows Server 2012, we move from 64 GB of RAM limitation to 1 TB per VM. This gives the organization the capacity to go to larger memory sizes if the hardware allocation allows. In addition to its expanded processor and memory support on hosts and for VMs, Hyper-V in Windows Server 2012 also expands support for Non-Uniform Memory Access (NUMA) from the host into the VM. NUMA allows the use of memory by processors to be optimized based on the location of the memory with respect to the processor. High-performance applications like Microsoft SQL Server have built-in optimizations that can take advantage of the NUMA topology of a system to improve how processor threads are scheduled and memory is allocated. In previous versions of Hyper-V, VMs were not NUMA-aware, which meant that when applications like SQL Server were run in VMs, these applications were unable to take advantage of such optimizations. Because NUMA was not used in previous versions, it was possible for a VM’s RAM to span NUMA nodes and access non-local memory. There is a performance impact when using non-local memory due to the fact that another memory controller (CPU) has to be contacted. But with VMs now being NUMA-aware in Windows Server 2012, the performance of applications like SQL Server can be significantly better. Note, however, that NUMA support in VMs works in Hyper-V in Windows Server 2012 only when Dynamic Memory has not been configured on the host. Virtual NUMA presents a NUMA topology within a VM so that the guest operating system and applications can make intelligent decisions about thread and memory allocation that are reflected in the physical NUMA topology of the host. For example, Figure 1 shows a NUMA-capable four-socket host machine with four physical NUMA nodes labeled 1 through 4. 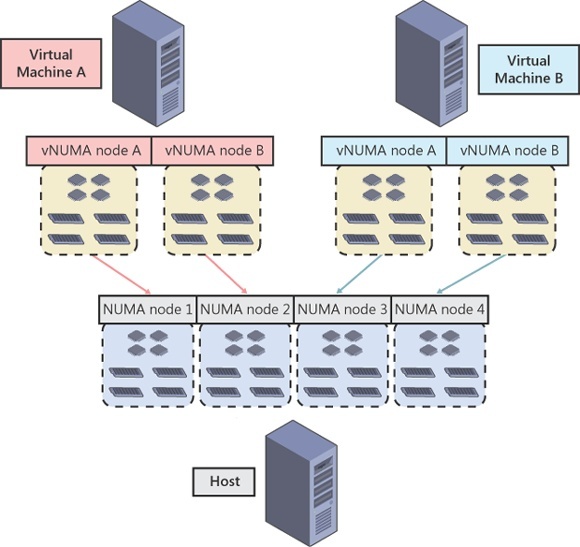 Two VMs are running on this host, and two virtual NUMA nodes are presented within each VM, and these virtual NUMA nodes align with physical NUMA nodes on the host based on policy. The result is that NUMA-aware applications like SQL Server installed on the guest operating system of one of these VMs would be able to allocate its thread and memory resources as if it was running directly upon a physical server that had two NUMA nodes. Virtual NUMA support also extends into high-availability solutions built using failover clustering in Windows Server 2012. This enables the failover cluster to place VMs more appropriately by evaluating the NUMA configuration of a node before moving a VM to the node to ensure the node is able to support the workload of the VM. This NUMA-awareness for VMs in failover clustering environments helps reduce the number of failover attempts which results in increased uptime for your VMs. For an overview of expanded processor and memory support for both hosts and VMs in Windows Server 2012, see the topic “Hyper-V Support for Scaling Up and Scaling Out Technical Preview” in the TechNet Library at http://technet.microsoft.com/en-us/library/hh831389.aspx. Figure 1. Example of virtual NUMA at work.